Today has been a day full of Star Wars Battlefront 2. I really am not too fond of the infantry part of the game, which seems to consist of alot of waiting for it to start, then running forever to reach the battle arena, just to get murdered as soon as you close in on the enemy. I have big problems even seeing what I am supposed to shoot at, much less get enought shots off to actually kill anyone before getting one-shotted by some twitching 13 year old. Gah! I am simply too old and slow for that. But the starfighter part…ooh yeah, thats the stuff. That brings me right back to the good old days playing X-wing vs Tie Fighter on local LAN. I still tend to get shot down by some twitching 13 year olds, but anyway. It is fun. At least is has been so far. I will probably soon tire of the incessant grind this game actually consists of, and I absolutely refuse to spend any money on buying random upgrades. It is not that good. I really wish that they could remake the old goldies, such as the X-wing and Tie Fighter singleplayer mission based games with this kind of graphics. That would be epic. In between bouts of getting shot down in flames, I have painted a little. 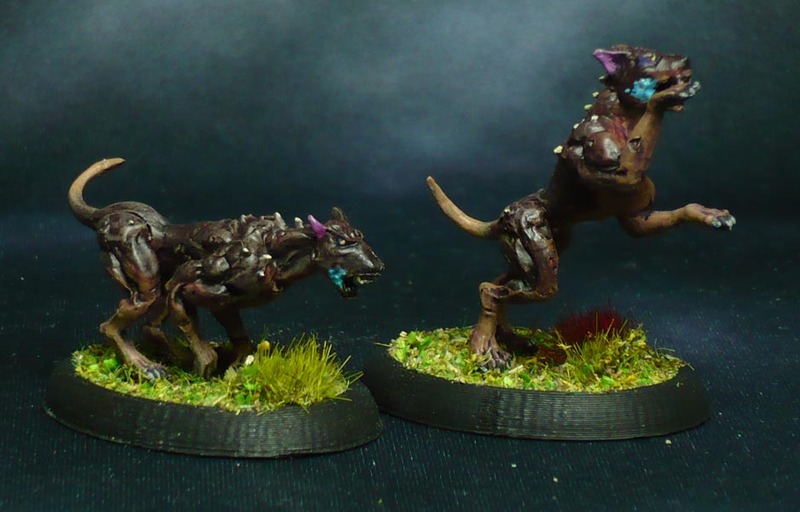 The six restic plague hounds with quick and easy PJs. I used the hot water method to bend and reposition four of the dogs somewhat, so they look more like individual dogs and not just three identical pairs. These ended up close to the “official” pinkish colour scheme. I was not really going for that, but there you are. The one to the right has been eating grass again… Only it is not at all well. Let’s hope it doesn’t go on the carpet. (I seem to have gotten som glue on it’s mouth when flocking the base. And now it is dry. Oh dear. I will have to cut the flock off and repaint that bit.) The other one has a cropped tail, as attack dogs often have. I regretted doing this almost immediately, as now the mini should have been much farther back on the base, and looks unbalanced. Bah! I think this pair ended up the most like actual dogs in the colouring. Yup, Doberman dogs are really vicious looking even without the plague making them rabid. 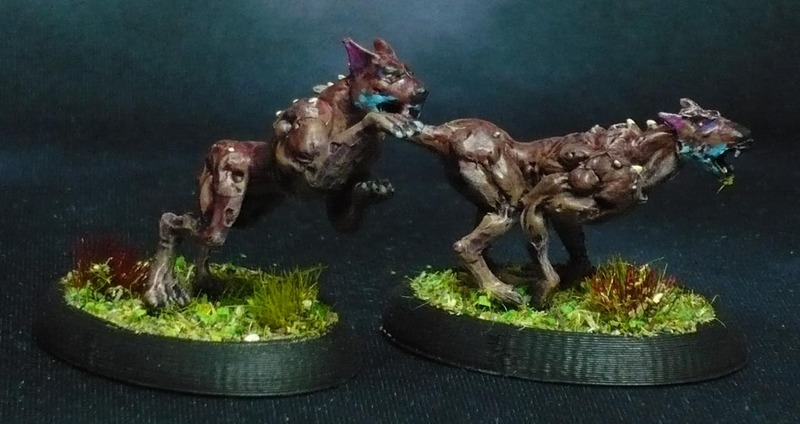 I painted them this by using different tones of brown and beige underneath and liberally washing with Citadel Druchii Violet wash, with some Citadel Carroburg Crimson wash slopped on here and there while the violet is still wet, finishing with a light drybrushing of the different skintones after the washes have dried. The results are the fleshtones you see. From here I drybrush different fleshtones and others to give them the plagueridden look. So, the question is; did I overdo the rabid froth-effect or not? Maybe I should have put some putty on to make bubbly foam? These models are really not Mantic’s best when it comes to the quality of details. The faces, mouths and paws in particular are not very well defined. I mean, they are perfectly servicable, you see what they represent, but they are not very good models. I think most of this is the material not being able to hold the detail, or the mould making process not being up to snuff for these, or a combination of such factors. I have not got any of the new HIPS plague dogs from the 3rd gen sprue, so I cannot make a comparison shot. I expect I will once I get hold of such a sprue. The first of the Kings of War Lower Abyssals in the middle is almost complete. Trying out the “Classic DOOM Imp” brown with white horns paint scheme, I think it worked fine. Next to him is Mars Attacks! Esteban Ramires with the minigun, and a partly hidden base of Orclings from Dungeon Saga at the back. 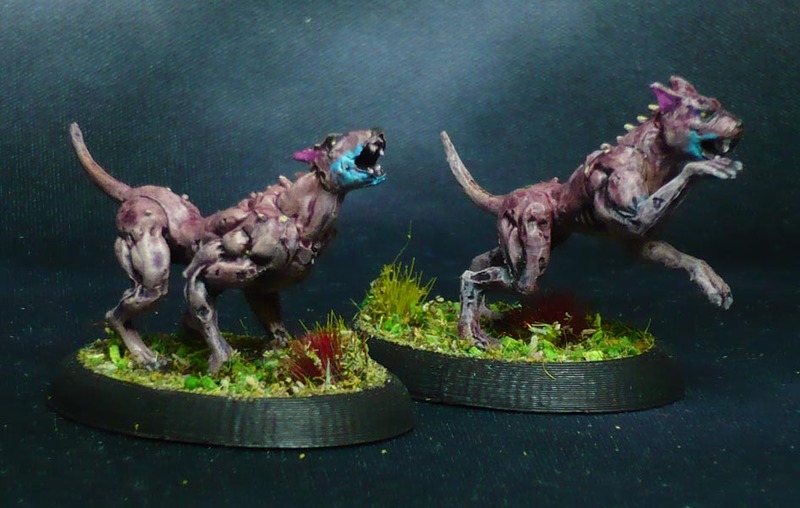 Apart from that there are some 3rd gen plague troops, basically the same skin tone variants as the dogs.